Zebra Mussel filter millions of gallons of water; it's how they feed. The result, the once soup-like Great Lakes are now crystal clear. That doesn't mean the water is unpolluted, far from it. Their output is crystal clear, which for divers is a definite plus. So you see, from a certain perspective, what started as a natural disaster has a definite upside. Now, I know some might argue that learning to love environmental disasters requires a very self-centered attitude. What I celebrate, others revile. I look forward to figuring out what new and clever angle I can come up with the next time we lay waste to some pristine wilderness area. Diving in Humber Bay in Toronto is the equivalent of having a craving for something sweet and having to settle for a suspiciously fuzzy-looking piece of old Halloween candy. It will fill a need but it's not something you're going to love or talk about. At Humber Bay the water is often questionably clean; the original rock bottom was scraped away years ago and used to build the city; and there is almost no animal life. 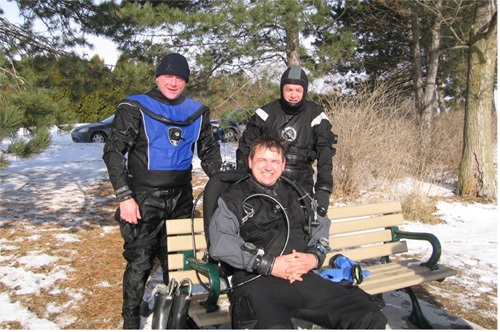 So why do I join the dozens of Toronto based divers that go to Humber Bay on a regular basis? To quote Sir Edmond Hillary: "Because it's there." 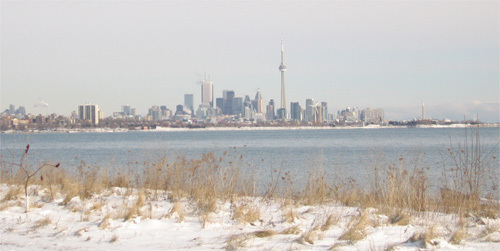 If you're a keen diver in Toronto, it's either splash around at Humber Bay or drive for several hours to find a decent spot. Many don't have the time to do that. So there's a small but dedicated cadre of people who traipse down there every Sunday, winter and summer, and "get wet." Now there are a couple of upsides to this semi-sane experience. First of all, there's a real sense of comradeship amongst the dedicated few--nothing bonds a group like going into the water when it's well below zero. And second, particularly in the winter, sometimes you get into the water and it's crystal clear. I've dived in Humber Bay when the visibility under water is almost tropical -- I'm able to see a good twenty meters or more. That turns a lousy dive into a fairly decent dive. And I owe it all to an environmental disaster. The bottom line (pun intended) is that I enjoy fabulous diving in the Great Lakes because of an infestation called the Zebra Mussel. Most people know about this little mollusk but for the few that might not, a quick recap. They're not a natural species to the Great Lakes. They arrived in the ballast of ships and were flushed into the water. Apparently they liked their new home because by now they've coated virtually every surface in the lakes causing most people to despise the obnoxious little creatures; they block drains, sink docks and despoil boats. Scientists wrings their collective hands and issue dire warnings about the consequences of foreign critters entering our ecosystem. All quite true, but to my way of thinking, possibly short-sighted. What they're missing is the Zebra Mussel's most redeeming feature, the silver lining in the disaster cloud: they filter millions of gallons of water; it's how they feed. The result, the once soup-like Great Lakes are now crystal clear. That doesn't mean the water is unpolluted, far from it. Zebra Mussels filter out sediment, not industrial pollutants. But their output is crystal clear, which for divers is a definite plus. Now when I'm diving the wreck of the Tiller off St. Catherine's or the Katie Eccles off Point Travers, I can often see the wreck from one hundred feet away. So you see, from a certain perspective, what started as a natural disaster has a definite upside. I suspect by now many of you might be muttering something about "selfish" and "limited perspective." Possibly true, but this isn't the first time I've seen the brighter side of an environmental disasters. A few years ago I was diving off Cape Breton Island in Chedabucto Bay. I was there to explore the wreck of the oil tanker Arrow. She went down in 1970 and spilled 10,000 tons of oil into the water. It was the equivalent of the Deepwater Horizon in its day. The local fishing industry was destroyed, hundreds of miles of coastline spoiled and countless birds and sea mammals killed by the toxic oil. Yet by the time I dived on the wreck in 2009, a remarkable transformation had taken place. The old wreck had become a thriving artificial reef. It was coated in tiny, orchid-like sea anemones; schools of Cunner and Cod swarmed the old super structure. The bottom around the ship was heavily populated by Lobster and Scallops. My host on the dive told me that Seals and Minke whales made regular stops at the wreck as did even the occasional rare Sunfish. A catastrophic event now transformed into my underwater playground. Now, I know some might argue that learning to love environmental disasters requires a very self-centered attitude. What I celebrate, others revile. And to be fair I've dived locations where I've not been able to find an upside to environmental disaster -- reefs that look as if someone has come along with a large vacuum cleaner and sucked everything living from the coral -- once vibrant, coloured organisms reduced to lifeless brown dead rocks. But essentially I like to think of myself as someone who likes to "always look on the brighter side of life." Albeit in this case, in a Monty Python, The Life of Brian kind of way. I'm also a bit of a fatalist. I'm pretty sure people are not going to change their ways. We're not going to develop some kind of highly evolved sense of custody over our natural environment. History supports me on this by the way -- look at Lebanon, once covered in thick forests and now more or less barren rock. Greece is much the same. Think about what I mentioned earlier about Humber Bay--the original bottom was literally scrapped off and carted away, what's left is an underwater moonscape. We have a long history of using and abusing nature and then moving on. So I decided I had a choice to make. Either I wring my hands and develop ulcers over mankind's inherently destructive nature or I learn to love natural disasters: try to find the positive side. Fortunately, diving has provided me with a great excuse to adopt this cavalier attitude. So now every time I crawl out of the water at Humber Bay, feeling very much like some primordial creature evolving from a swamp (in midsummer a lot of weed grows in the shallow part of the bay and I'm usually covered in it from head to foot) I give thanks that this dive was made possible by an environmental disaster. I look forward to figuring out what new and clever angle I can come up with the next time we lay waste to some pristine wilderness area. I have great hopes for the massive number of pipelines being planned by the current government, though I confess I'm still struggling with the silver lining in global warming (being able to swim through the flooded office buildings in Miami?) and the oil sands have me completely stumped.